Beirut (AFP) – Syrian regime forces backed by Russia made sweeping advances on Monday against rebels holding out in the country’s vital southern zone. For nearly one month, Syria’s government has worked to capture the provinces of Daraa and Quneitra with a mix of heavy bombardment, ground attacks and surrender deals brokered by Moscow. Despite an international outcry, government forces have retaken swathes of the area including the border with Jordan and are inching closer to the sensitive frontier with the Israeli-occupied Golan Heights. Regime troops made another “quick advance” against rebels on Monday, according to the Syrian Observatory for Human Rights, a Britain-based war monitor which relies on a network of sources inside the country. “Regime forces took a number of towns in western parts of Daraa province, some through clashes with those refusing to join the handover deals, and others after agreements were reached,” said Observatory head Rami Abdel Rahman. A string of towns — Al-Hara, Samlin, and Zimrin — had agreed to fall back into regime control, while troops overran Al-Tiha militarily. 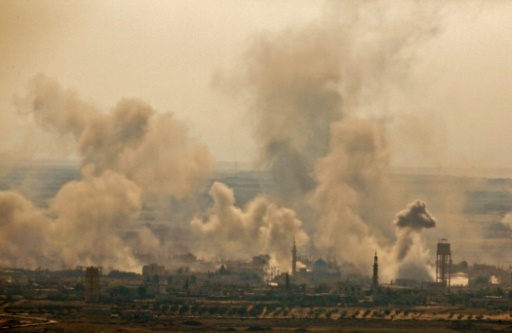 “With that advance, the regime holds more than 90 percent of Daraa province,” Abdel Rahman told AFP. Citing a military source, Syrian state news agency SANA also said the army had captured new territory, including Al-Tiha and Zimrin. Heavy fighting had been raging over a hilltop known as Tallet Al-Hara and held by Al-Qaeda’s former affiliate, Hayat Tahrir al-Sham (HTS), said the Observatory. AFP / Mohamad ABAZEED. 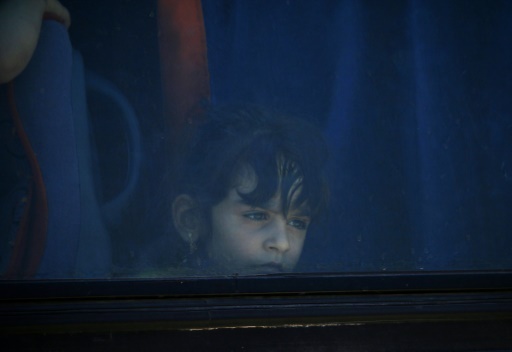 A Syrian girl looks out of a bus window during the evacuation of rebels and their families from Daraa city on July 15, 2018. HTS had refused a surrender, ushering in a wave of regime and Russian shelling that have killed 30 jihadists since Sunday. An HTS ambush then left 12 regime forces dead, Abdel Rahman said. An AFP photographer there saw a plume of smoke emerging from the sloping hilltop overlooking agricultural plains on Monday. By the afternoon, Syrian state news agency SANA said government forces had captured Tallet Al-Hara. Beyond the hilltop, the sliver of Daraa that still escapes regime control includes the rebel town of Nawa and a small pocket held by an Islamic State group affiliate. Rebels in Nawa, where tens of thousands of people live, are in talks with Russia for a potential handover deal too, according to the Observatory. Moscow has helped the regime secure these negotiated surrenders in several key areas, including second city Aleppo in 2016 and the rebel bastion of Eastern Ghouta outside Damascus in April. For the south, it pressured rebels to agreed to hand over eastern parts of Daraa province in early July and the provincial capital last week. Opposition forces there handed over territory as well as heavy weapons to government troops, in exchange for a halt to bombing and transfer to rebel territory elsewhere. On Sunday, several hundred rebels and civilians were bussed from Daraa city to opposition-held Idlib in the northwest, paving the way for it to return fully to the government fold. The regime’s recapture of Daraa city would be a huge propaganda win for Syrian President Bashar al-Assad as the seven-year uprising against him has its roots there. On Monday, state news agency SANA reported that journalist Mustafa Salama of pro-regime television channel Sama was killed by rebel shelling in the Masshara area of Quneitra province. Syrian and Russian bombardment battered the province of Quneitra, which remains mostly in rebel hands, for a second day on Monday. Quneitra lies directly west of Daraa and is bordered on the other side by the highly sensitive buffer zone with the Israeli-occupied Golan. Government forces have made a modest ground advance there, the Observatory and state media both said. Israel has been on high alert since hostilities erupted last month in the south. It says its main priority is preventing its archfoe Iran, a key backer of Assad, from building up its military installations in Syria. Late Sunday, suspected Israeli missiles hit a military position in Syria’s northern Aleppo province where the Observatory says elite Iranian forces are stationed. The Britain-based monitor said nine pro-regime fighters were killed in the strikes, at least six of them Syrian. But Syrian state media denied any casualties and said Israel had launched the raids to try to help beleaguered rebels in the south. Israel has refused to comment. Featured Photo: AFP / JALAA MAREY. A picture taken from the Israeli-annexed Golan Heights shows smoke rising from reported Syrian and Russian air strikes across the border in Syria’s Quneitra province on July 16, 2018.